St. John's Prep receiver Wes Rockett chats with the media after the Eagles' big win. BRIDGEWATER, Mass.- It’s safe to say that Mike Yarin is comfortable under center. The baseball star began playing quarterback just two months ago during training camp for St. John’s Prep, and he certainly went through some growing pains. 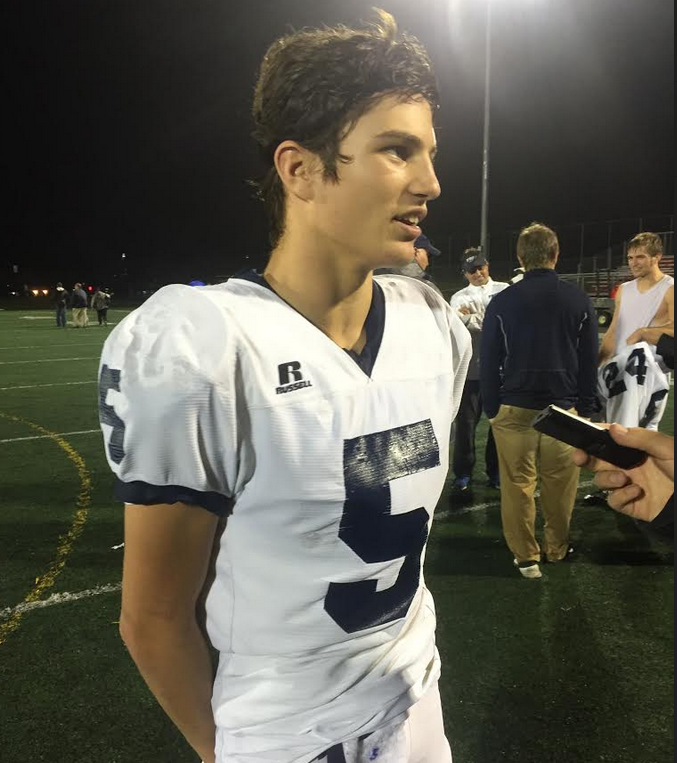 But, when he dropped back on fourth-and-26, eluded pressure yet again, and threw a dime to Wes Rockett for a score to seal the Eagles' 17-7 win over Bridgewater-Raynham on Friday night, Yarin seemed like he had been playing the position all his life. St. John’s Prep (5-2) came to Bridgewater-Raynham (4-3) riding an impressive three-game winning streak over conference foes. Yet, this non-conference road tilt could have swung either way. The Trojans snatched the momentum when Marcus McNeil broke a 77-yard kick return and Shawn Noel (10 carries, 34 yards, TD) rushed for a short touchdown to make it 7-3 just before halftime. Showing no panic, Yarin (9-of-13, 109 yards, TD; 12 carries, 56 yards) and the Eagles executed a seven-play, 68-yard scoring drive to regain the lead at the start of the third quarter. The Eagle defense was dominant after the break as well, limiting the Trojans to zero net yards from scrimmage on just seven plays. But the game still hung in the balance until Yarin managed to elude the pass rush and find Wes Rockett (3 receptions, 48 yards, TD) for the score that made it a two-possession game. After that improbable play, the Trojans went three-and-out once again, and Prep’s offensive line controlled the line of scrimmage, which allowed tailbacks Aise Pream (16 carries, 80 yards, TD) and Trent Tully (5 carries, 41 yards) to seal the game with effective running. “We’re a different team than we were in September. We’re becoming a more resilient group, a more focused group, and a tougher group. All of that was on display tonight,” asserted St. Pierre. With the win, St. John’s Prep clinches at least a share of the Catholic Conference title with Xaverian (5-1), as the Hawks were up 10-0 over BC High when that game was postponed due to weather. Regardless of the regular season results, St. Pierre and his players eagerly await the beginning of the MIAA State Tournament next weekend. “We have no control over who we see in the first round, but we’re playing our best ball at the right time, and we’re ready for a one-game season each week,” said St. Pierre. Now that their new quarterback is playing as well as any signal caller in the state, the Eagles are having plenty of fun and coming into each game with a heightened sense of confidence.